It is early May 1863. 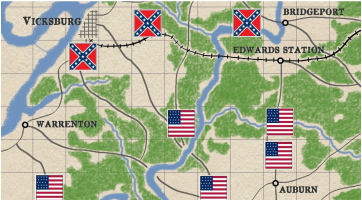 Ulysses S Grant and over 40,000 Union troops have crossed the Mississippi and now threaten both Vicksburg and the state capital of Jackson. Will Grant cut free from his river-side supply base? 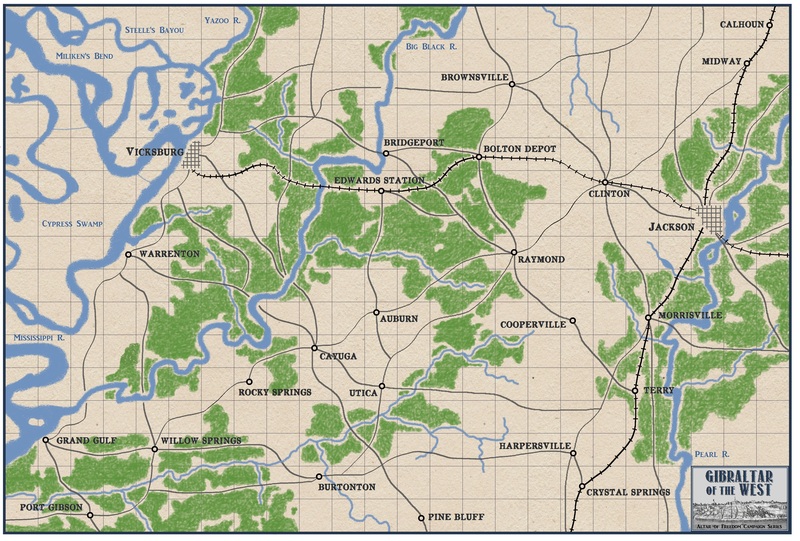 Can Pemberton unite with the relief army assembling near Jackson? "Gibraltar of the West" is a free campaign supplement, allowing players to re-fight the pivotal three weeks of the Vicksburg campaign. Players maneuver their divisions across a large theater map with the potential to fight a series of interconnected battles. Our simple rules are only 10 pages, but still include logistics, supply, weather, variable map movement, asymmetrical victory conditions, and historical random events. Did we mention it's free? Note: This is a campaign supplement only--the main rule book is still required to play the battles. Theater Map. A color copy of the theater map is included in the rules, spread out across two pages, which you can cut out and tape together into an approximately 10"x 15" map. Event Cards. The campaign requires the use of ten event cards, representing random events such as bad weather or new reinforcements. The cards are sized as standard poker cards, which could be slid into plastic protective sleeves if you so choose. Would you like to upgrade your free paper map to a fully magnetic game board with custom, magnetized map tokens? Of course you would. Read our photo-tutorial to learn how you can make your own magnetic rig for under $30! Want to read a detailed, photo-packed report of the Vicksburg campaign? We have it.